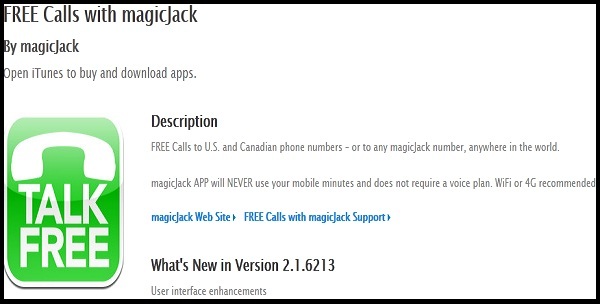 MagicJack App for iPhone | iPad | iPod Touch Application | Free Pc to Phone Calls, Free Voip Calls to India International ! Magicjack device needs no introduction, it was announced 2008 product of the year. Also named as Skype killer it enables you to make Free Calls to US and Canada. Following the first version of the device, the more advanced version was also launched named "MagicJack Plus". It was also a great success as many people preferred a device without the need of a computer. It should not be a much surprise that Magicjack has launched iPhone/iPad/iPod Touch application and this app allows you to make free calls to US and Canada for free. In this post we will be discussing about the MagicJack Application for iOS devices, which allows you to make unlimited free calls to the U.S. and Canada. Yes, no strings attached and no credit card required. As long as you are having internet in your mobile (or lets call it free data plan in your iPhone), you can theoretically make unlimited voice calls to US for free. As Magicjack app works on iPod Touch and iPad, so you can turn your iPod/iPad to iPhone and make free calls. MagicJack app does not use your mobile minutes and does not require a voice plan. All you need is internet on your phone (wifi or 3G). - The app is free for download. Check this link. - Test drive it. No account needed. Make outgoing calls to U.S. and Canadian landlines and cell numbers and any magicJack number. - Simply use that account (sign in) to make calls, you can use your existing number, and access all of your associated contacts. The benefit of having a MagicJack Account (or a device) is that you will get a free US number, otherwise the calls will be placed from any random number (and everytime a new number). You can be anywhere in the world (be it India, Dubai, UAE, USA or any other country), as long as you have internet on your mobile and can download the MagicJack app, you can call US and Canada numbers for free. All it requires is internet on mobile. You can also receive calls on your magicjack phone number, which is a US number. This provides flexibility to your friends in US to call you at their local rates. A magicjack number starts and ends with an asterisk/star, like so: *0123456777* and can be dialed directly from any magicJack. cannot login into my account when I am travelling to other countries with wi-fi. nt sure what is the problem.. does anyone have any idea...?